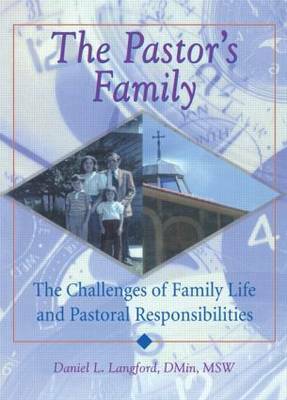 Describing the difficulties of balancing a career and family life, The Pastor's Family: The Challenges of Family Life and Pastoral Responsibilities is a personal narrative that discusses the all-too-familiar practice of neglecting your family for your job. Pastors will learn the importance of balancing time and attention between their families and religious careers by exploring the problems caused by one pastor's prolonged absence from home. Containing research and first-hand experiences, The Pastor's Family calls for a change in ministry policies that will enable pastors to devote as much time to their families as they do to their congregations.Containing stories and anecdotes from the author, his wife, and his two children, this book offers suggestions on how to improve the physical, emotional, and spiritual health of a pastor's family. The information and insight provided by The Pastor's Family will also help pastors'wives realize that they are not alone in their demanding roles and will help church policymakers discover the need to improve relations between the congregation and the pastor's family. With the hope that the universal problems of pastors'families will be revealed, the author shares with you methods that have helped bring him and his family closer together, including: understanding the expectations of the stereotypical "superpastor" and learning how to set boundaries between family life and career realizing that a pastor's family is subject to the same problems and challenges other families face and helping your family deal with this pressure learning the various definitions of codependency and how this can attribute to the neglect of your family discussing the history of abuse of pastors'families through the Bible and famous religious figures recognizing the discrimination of a pastor's wife and her sufferings, such as coping with her husband's various psychological challenges and being expected to always help her husband with his career discovering how conflicts can provoke communication, release emotions, identify and clarify problems, and permit individualization understanding why people feel a loss of power or personal rejection when their requests are not grantedEmphasizing the practice of setting boundaries, The Pastor's Family examines ways to promote assertiveness through self-talk and self-differentiation that will help you defeat codependent behavior. This will teach you that it is all right to say "no"-- that it is all right to do things for yourself. From The Pastor's Family, you will learn how to correct the ideology that makes many pastors feel they must honor every parishioner request, despite the effect it will have on his family. Through stories of hardship and personal revelations, this book will help you realize the need for church policy reforms that will allow pastors to be looked upon as humans who have familiesbesides their parishioners.